1 General features of the Shabaka Stone. 1.1 Physical parameters & layout. 2 The age of the inscription and its hermeneutical levels. 2.1 Extant text, original documents and original ideas. 2.2 Worm-eaten documents of the late New Kingdom. 2.3 A new composition of the Late Period. 3 The spirito-political schemes of Pharaoh Shabaka. 3.1 Historical circumstances regarding the kingdom of Kush. 3.2 The intent of Pharaoh Shabaka. 3.3 Political mystery-play at Memphis. The Shabaka Stone (British Museum 498) is a heavy, nearly black slab of "Green breccia" from Wadi Hammamat of 137 wide. The left side is ca. 91 cm, the right side ca. 95 cm high. With a density of 2.7g/cm³, its weight is about 430 kg. It is named after the "black" Pharaoh Shabaka (ca.712- 698 BCE), who ruled in the XXVth Dynasty (ca. 716 - 702 BCE) and who's Old Kingdom styled prenomen name ("Neferkare") is mentioned twice (in LINE 1). It was given by the First Lord of the Admiralty George John 2nd Earl Spencer (1758 - 1834) to the British Museum in 1805. It was registered in the inventory of the Museum on the 13th of July of that year. Up to now, its povenance is still unknown. For nearly a century, the Shabaka Stone and its inscription remained unconsidered by egyptologists. in : Zeitschrift für Ägyptische Sprache und Altertumskunde, Berlin, n°39 (102), 1902, plates 1 & 2. For a larger picture : click here. Being a stela, it has a written surface of 132 by 68.8 cm, which consists of 3 inscribed horizontal rows (LINES 1, 2 & 48) and 61 columns carved into the obstinate stone with copper chisels (some columns contain scribal voids, while LINE 5 is empty). 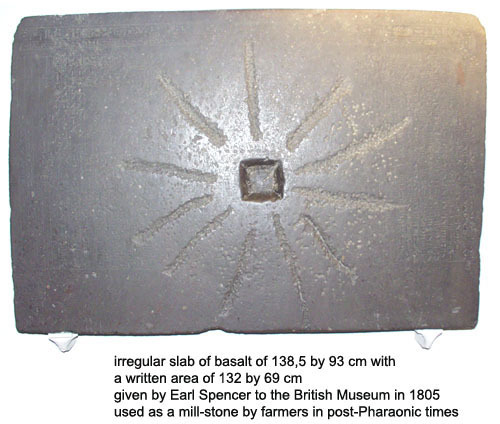 A rectangular squarish hole of 12 cm by 14cm is cut deep into the stone in the center, out of which eleven rough channels or stripes in length of 25 to 38 cm radiate as a result of ignorant disregard in post-Pharaonic Egypt, when it was probably used as a nether millstone or as a foundation stone. The scribal voids may refer to the damaged original Pharaoh Shabaka found, namely the outermost edge of a scroll rolled open from left to right (Sethe, 1928). 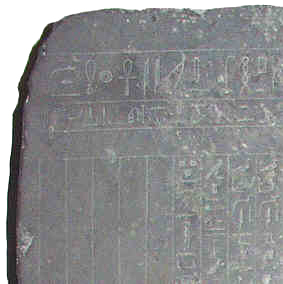 This respectless, rejectable activity has caused a large area of the stone to be worn, with as result the full or partial erasure of 25 lines (LINES 25 - 44) in the center of the inscription, dividing it in two parts : one dealing with Horus' justification to his father's throne (first, left hand side, rendered in a dramatical, responsive way) and the so-called "theology of Memphis" (last, right hand side, in prose). Worn areas and scribal voids have to be distinguished. LINES 3 & 4 are not damaged (except perhaps in the original), but placed by Shabaka's scribe in an empty area consisting of several columns (cf. infra). The inscription on the stone is faint thoughout and illegible in the middle. Spatial semantics mark the introduction of the "preface" to this Memphis Theology. The latter is followed by a prozaic "confirmation" of the dramatics of the responsive, left half. Unfortunately, what united both parts is completely lost. Under "spatial semantics" are understood all meaningful visual & graphic features contained in a text, elucidating the architecture of the composition, highlighting parts of the text and -on top of what is always the case in hieroglyphic writing- adding information which is not contained in the phonography of the text (cf. the determinative in Egyptian), etc. James Henry Breasted was the first egyptologist to copy the inscription on the Shabaka Stone by hand, remarking that : "I have no doubt that with a better light than it is possible to get in the museum gallery, more could in places be gotten out." He made this copy for his contribution to the Wörterbuch der ägyptischen Sprache. Then, in 1901, he published a brief paper : "Philosophy of a Memphite Priest" and wrote it was "the most remarkable monument of Egyptian thought which we possess." Indeed, for Breasted, the inscription was "the oldest known formulation of a philosophical Weltanschauung." He also discovered the text did not read from right to left but in "retrograde form". This script is common in religious texts on papyrus. The order in which the columns had to be read was reversed, even though the arrangement of individual hieroglyphs remain facing the right. This and other elements of the special layout of the inscription, compelled Breasted to date the "worm-eaten" original mentioned in LINE 2 to the early XVIIIth Dynasty. Breasted's 1901 paper prompted other scholars to study the extant text. In 1909, Adolf Erman first put the word "memphitischer" and "Theologie" together in his "Ein Denkmal memphitischer Theologie". It was Sethe, who -in 1928- published his "'Denkmal memphitische Theologie"', der Shabako-Stein", and understood it to be part of "Dramatische Texte zu altägyptischen Mysterienspielen". The connotations "dramatic" & "mystery-play" should be given due consideration. When visiting the British Museum in 2001 (a century after Breasted's first copy), one of the two lights placed above the stone was found flickering, making it impossible to copy the text properly. This was switched off by the Curator, placing the left half of the first two lines in the shadow of the wooden light-fixture placed above the stone. In 2004, both lights were turned off and now this shadow covers the complete titulary & colophon. Only by manipulating my digital pictures, was it possible to eliminate this dark rim. The text provided by the museum begins with the words : "This text, known as the Shabaqo Stone, etc ..." ! Breasted complaints are apparently still valid today. This "most remarkable monument of Egyptian thought which we possess" is still placed out of focus and neglected (while the Rosetta Stone is commercially exploited to the point of frenzy - cf. the Rosetta key ring and the Rosetta mug !). introduce visual units which should be taken into account to grasp the compositional intent of the inscription, as in certain scribal voids (LINE 5), dispositions of titles (LINES 3 - 7), responsive, dramatical speech-structures (LINES 10 - 35b) & headings (LINE 48). Let us turn to the inscription and study each case separately. • LINE 1 (horizontal) is Shabaka's titulary, with its (as usual) fivefold royal names, except for the surgical erasure of the final, "nomen" name in the last cartouche ("Shebek", an Egyptianized form of the Nubian "Shabaka" or "Shabaqo" - "Sebaq-tawy" probably means : "He who blesses the Two Lands"). Indeed, as such, the name "Shabaka" can not be found on the stone, although we can read his prenomen : Neferkare. Shabaka Stone : LINE : "Neferkare (prenomen), son of Re, (reconstruction of erased nomen name)"
LINE 1 (TITULARY) is larger than any other line on the stone and written in almost symmetrical (mirror) script, centered on the hieroglyph "life", and reading out therefrom, to both left & right. Shabaka Stone : LINE 1 : "living Horus : excellent Two Lands" - mirror script centered on "life"
"The living Horus : excellent Two Lands ; the Two Ladies : excellent Two Lands ; the Golden Horus : excellent Two Lands ; King of Upper and Lower Egypt : Neferkare, the son of Re, [Shabaka], beloved of Ptah-South-of-his-Wall, who lives like Re forever." 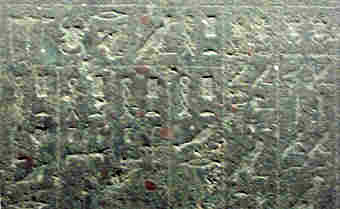 Shabaka Stone, lines 1 (horizontal), titulary. • LINE 2 (COLOPHON), the second-largest line, is the story of how Pharaoh Shabaka found "in the House of his father Ptah" a worm-eaten ancient (papyrus ?) text of which he made a new & better copy, the lasting Shabaka Stone. Here too, the Nubian nomen name or "Shabaka" has been removed. This line reads from left to right, i.e. in the regular way, which is an exception here. "This writing was copied out anew by his majesty in the House of his father Ptah-South-of-his-Wall, for his majesty found it to be a work of the ancestors which was worm-eaten, so that it could not be understood from the beginning to the end. His majesty copied it anew so that it became better than it had been before, in order that his name might endure and his monument last in the House of his father Ptah-South-of-his-Wall throughout eternity, as a work done by the son of Re [Shabaka] for his father Ptah-Tenen, so that he might live forever." Shabaka Stone, line 2 (horizontal), colophon. LINE 1 and 2 are followed by a void horizontal space, reaffirming the first two lines form a whole, namely the "general heading". This consists of the titulary followed by the colophon. Right at the beginning, the mirror-script used in LINE 1 points to visual semantics reminiscent of Egyptian art. The retrograde script of the columns, starting with LINE 3, contrasts with the colophon, as it were placing it outside the context of the inscription. "(3) He is this Ptah who proclaims by the great name : Tenen. (4) He who united this land of the South as King of Upper Egypt and this land of the Delta as King of Lower Egypt." Shabaka Stone : (left) first 5 columns contain voids with 5 completely void. (right) : detail of the inscribed surface of these lines. "(5) void, no inscription (6) He indeed begat Atum who gave birth to the Ennead. (7) Geb commanded that the Ennead gather to him. He judged between Horus and Seth ..."
• LINE 4 confirms the political power of Ptah. He is the uniter of Upper and Lower Egypt, and so only Ptah is Pharaoh. Above (celestial, realm of deities) as well as below (terrestrial, regarding creation, realm of humans) is Ptah's great name in charge. • LINE 6 is the "preface" to the mystery-drama of succession itself. In it, other deities will be invoked. Hence, the author makes sure to mention Ptah is the father of Atum, the creator-god of myth and pre-rationality, who created himself and all the rest. Hence, Ptah is before Atum. This idea of firstness is repeated in LINE 48, the heading of the lines introducing the theology of Memphis & the political unity of the royal Residence. However, because Ptah begat the Heliopolitan creator-god Atum, his name is greater than Atum's, although the latter gave birth to the Ennead, i.e. to all gods & goddesses. Hence, Ptah's all-encompassing nature is put into evidence. The supremacy of Ptah over Atum is the core of this theology. Hence, LINES 3 - 6 contain the summary of Ptah's claims to suprimacy over the eternal and temporal orders of being. • LINE 7 : here the actual political mystery-drama starts. Lines 10 to 35 are responsive. When the gods are speaking to each other, their hieroglyphs face each other, suggestive of Egyptian pictoral composition. This spatial syntax is also reminiscent of ritual "rubrics" and the stage-work of mystery-plays & sacred festivals. Unfortunately, these lines are very worn and so the complete drama is lost. 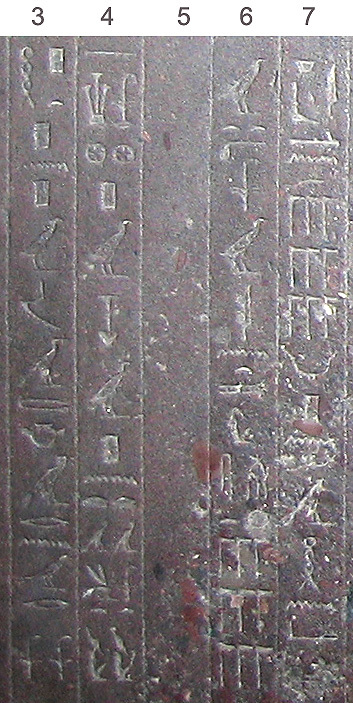 Shabaka Stone : LINES 15a - 17a : "Geb's words to the nine gods :"
Notice how the flagpoles are reversed, pointing to the Geb-goose, as in direct speech. "(10a) Geb's words to Seth : "Go to the place in which you were born." (10b) Seth : Upper Egypt. (11a) Geb's words to Horus : "Go to the place in which your father was drowned." (11b) Horus : Lower Egypt. (12a) Geb's words to Horus and Seth : "I have separated you." (12b) Lower and Upper Egypt. (10c, 11c, 12c) Then it seemed wrong to Geb that the portion of Horus was like the portion of Seth. So Geb gave Horus his inheritance, for he is the son of his firstborn son. (18b) Horus, on the birthday of the Opener-of-the-ways." (14c) the two Great in Magic upon his head. He is Horus who arose as King of Upper and Lower Egypt, who united the Two Lands in the Nome of the (White) Wall, the place in which the Two Lands were united. (17c) --- the burial of Horus in the House of Sokar. (19) for Horus had drowned in his water. Isis [and Nephthys] looked out. (20a) Horus speaks to Isis and Nephthys : "Hurry, grasp him ---." (21a) Isis and Nephthys speak to Horus : "We come, we take you ---." (22) at the royal fortress, to the North of ---. (23) There was built the royal fortress ---. (28b) Isis causes [Horus and Seth] to come. (29b) Isis speaks to Horus and Seth : "---." (30b) Isis speaks to Horus and Seth : "Make peace ---." (31b) Isis speaks to Horus and Seth : "Life will be pleasant for you when ---." (32b) Isis speaks to Horus and Seth : "It is he who dries your tears ---." (33b - 35b) Isis speaks to ---. Whether this mystery-play stopped before LINE 48 is unknown (it certainly runs to LINE 35b). So it is possible there were of few lines joining the two major parts of the inscription (LINES 36 - 47), but this is in no way certain. Shabaka Stone : LINE 48 : "the gods who manifest in Ptah"
• LINE 48 has a unique spatial disposition : retrograde and horizontal. 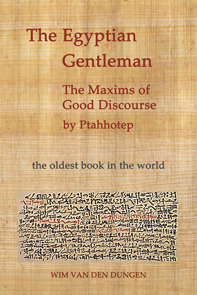 It is intended as the heading for the text below, which introduces the epiphanies of Ptah, i.e. his Ennead. The position of LINE 48 indicates the text which follows is of a different nature than the dramatical, responsive justification of the throne of Horus. The unique spatial disposition of LINE 48 coordinates this brief horizontal with the vertical texts directly beneath it. This because it is the heading for the inscription below, introducing the theology of Ptah of Memphis. Shabaka Stone : LINES 48-52 - notice mummiform Ptah with skull cap & was-scepter standing in a shrine. (49b) [Ptah] --- who bore the gods. (50a) Ptah-Nun, the father who gave birth to Atum. (50b) [Ptah] --- who bore the gods. (52b) [Ptah] --- Nefer-Tem at the nose of Re every day." After the divine speech of the deities in the dramatical section (LINES 7 - 35b), LINES 48 - 52 reiterate the unique nature of Ptah, who created all (cf. LINE 6). In this way, the divine comedy is flanked on two sides by the articulation of divine unity. Furthermore, by placing Ptah in a shrine, Shabaka's scribe no doubt wanted to direct the reader's attention to what followed, namely the "core" of the inscription, the theology of Ptah of Memphis. Good fortune has kept it intact despite the ignorance of those who used the stone for its shape and weight ! In LINE 53, "Ptah-the-Great" is invoked. The greatness of Ptah and the superiority of his theology is directly related to the "heart and tongue of the Ennead" (LINE 52a) and the whole theology of Memphis is a justification of Ptah's exclusiveness (the "very great") on the basis of an original redefinition of the concepts "heart" & "thought", thereby articulating the earliest known (proto-rational) "logos"-philosophy. Although gods & goddesses are mentioned, it is stressed they came into being "in" Ptah, in his heart and by his tongue. After Ptah's epiphanies (LINES 48 - 52), the "Memphis Theology" (LINES 53 - 61) follows. Both LINES 53 & 54 are introduced using parallel script, whereby a doubling occurs and two lines are pressed into one. The end of LINE 53 contains a large scribal void, showing the intent was to place two of these parallel inscriptions next to each other. For only in this configuration is the central verb "to come into being" (the scarab) repeated four times in a row, aligning this hieroglyph with the same verb in LINE 48, were Ptah's creation of the gods is mentioned (in the Pyramid Texts, four repetitions point to the four quaters of the horizon). LINES 53 - 61 are studied in a paper on the Memphis Theology. "(53) There comes into being in the heart ; there comes into being by the tongue as the image of Atum ! Ptah is the very great, who gives life to all the gods and their kas. Lo, through this heart and by this tongue. (54) Horus came into being in him ; Thoth came into being in him as Ptah. Life power came into being in the heart and by the tongue and in all limbs, in accordance with the teaching that it (the heart) is in all bodies and it (the tongue) is in every mouth of all gods, all men, all flocks, all creeping things and whatever lives ; thinking whatever the heart wishes and commanding whatever the tongue wishes ! (58) the movements of all the limbs, according to this word which is devised by the heart and comes forth by the tongue and creates the performance of everything. (59) divine offerings, all good things. Thus Thoth knew and recorded that he is the mightiest of the gods. Thus Ptah was satisfied after he had made all things and all divine words. (60) shrines, he settled their offerings, he established their shrines, he made their bodies according to their wishes. Thus the gods entered into their bodies of every kind of wood, of every kind of stone, of every kind of clay, in every kind of thing that grows upon him (61) in which they came to be. Thus all the gods and their kas were gathered to him, content and united with the Lord of the Two Lands. (62) owing to the fact that Horus was drowned in his water. Isis and Nephthys looked out, beheld him, and attended to him. Horus quickly commanded Isis and Nephthys to grasp Horus and prevent his drowning. (63) They heeded in time and brought him to land. He entered the secret portals in the glory of the Lords of Eternity, in the steps of him who rises in the horizon, on the ways of Re at the Great Throne. (64) He entered the palace and joined the gods of Tenen Ptah, Lord of Years. Thus Horus came into the earth at the Royal Fortress, to the North of this land to which he had come. His son Horus arose as King of Upper Egypt, arose as King of Lower Egypt, in the embrace of his father Horus and of the gods in front of him and behind him." 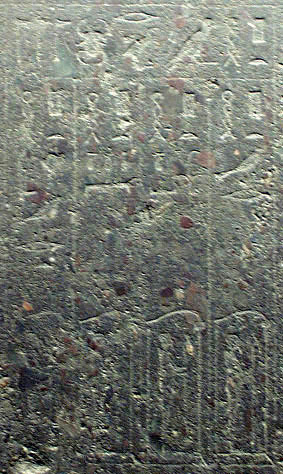 1.3 Contents of the inscription on the Shabaka Stone. LINES 7 - 35b : the mystery-drama : here the division (decided by Geb) of the rule of Egypt between Horus and Seth is narrated and enacted. This settlement is replaced by the union of the Two Lands under the sole rule of Horus, who is a manifestation of Ptah. LINES 61 - 64 : the royal residence : Memphis is the city of Ptah-Tenen. LINES 58 - 61 : pan-en-theism : poetical affirmation that Ptah is everywhere & everything and that all is in Ptah. Ptah is above (celestial) as well as below (terrestrial). 2.1 Extant text, original documents and original idea. "The Memphite Theology presents the religious teaching for Menes' new capital. It combines views which we can recognize as new, since they concern the new foundation ; others which we suspect to be new because they run counter to common Egyptian beliefs and could hardly have gained acceptance it they had not been part of the great movement at the dawn of history. Other doctrines again seem to be rooted in Egyptian, or even African, traditions of the greatest antiquity." At present, Grimal is the only egyptologist who continues to propose Old Kingdom dates for the lost original mentioned in LINE 2. "Ce texte date manifestement de l'Ancient Empire, période où Memphis joua le premier rôle national, et sans doute même de la Ve dynastie, c'est-à-dire de l'époque où la doctrine héliopolitaine l'a définitivement emporté." - Grimal, 1988, p.57, my italics. However, for Friedrich Junge (1973), there are no philological grounds to ascribe the text to the Old Kingdom. As Breasted, he returned to the New Kingdom to find the source(s) used by Shabaka's scribe. He thinks an original compendium of texts was transformed in a free and adaptive way, shaping a new and more complex configuration. 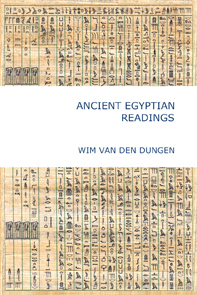 The original compendium might date back as far as the Ramesside period, the late New Kingdom, a period of intensive religious speculation (XXth Dynasty - ca. 1188 - 1075 BCE - cf. the Hymns to Amun). Indeed, after Amarna (ca. 1336 BCE), Ptah & Memphis were important again. Hornung (1989) also rejects an Old Kingdom date for the original text and accepts a late New Kingdom date. original idea : "Sia" & "Hu" in the Pyramid Texts or (late Vth & VIth Dynasties (ca.2378 - 2205) - Old Kingdom (see my The Creative Verb in Kemet). If the original, worm-eaten compendium found by Pharaoh Shabaka was written in the late New Kingdom (which is very likely), and the hermeneutical form of these New Kingdom originals was canonical, i.e. defining a well-defined cultural identity or symbolic form (concerning Ptah of Memphis), implying these documents were the culmination of the evolutionary process of the form of the thoughts in question and not just the whimsical invention of the Memphite theologians of the New Kingdom, then clearly the origin of these ideas (perhaps not documented as such) could bring us back to earlier periods. The proposed original text could then be regarded as a summary or canon of an older tradition, with an even more remote historical origin, going back to the moment when these ideas actually emerged for the first time (likely in much cruder and less coherent forms). Why not as far back as the Old Kingdom, when -although the Heliopolitan view predominated- the role of Ptah of Memphis is attested ? He was the guardian of the union of the Two Lands (cf. Menes). At Memphis, Pharaoh was enthroned, and so the "Walls" was the dynastic city par excellence. Through his Great Word, Pharaoh established Maat. His tongue was the pilot in charge of the bark of righteousness and truth. Given the important theological crisis at hand after Amenhotep IV (Akhenaton), namely the restoration of the "true religion" and the (incomplete) destruction of the rejected influence of the culture of Amarna and the theology of Akhenaten, a return to Ptah of Memphis could be argued as inevitable and rewarding to seal the completion of the restoration. 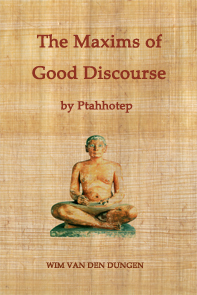 The all-comprehensive nature of Ptah's creative thoughts is also suggestive of the New Solar Theology and the conceptual revolutions brought about by Amarna theology (like the rejection of the plural for the word "god"). Hence, as was also the case in art, all traces of the changes Amarna had brought, were not eradicated. Moreover, does the strong "political" message of the original text not point to the restored post-Amarna context (for example early XIXth Dynasty under Seti I or Ramesses II) ? Even during the wildest days of Akhenaten, not all ancient cults had stopped and nobody knows how many gods & goddesses had been worshipped in secret. After the death of Akhenaten, the capital remained only two years in al-Amarna before it moved (under Tutankhamun) to Memphis. In the period of restoration which followed his reign, the main goal was to maintain the unity of the Two Lands by allowing Pharaoh to make strong political statements of monumental proportions (cf. Seti I, Ramesses II). The choice of Ptah can thus also be attributed to the theo-political importance of Memphis as the place of coronation of the living god on Earth, who again properly invited the deities who had left Egypt and who headed the temple cults of the old pantheon. In the Ramesside period, the thirteenth son of Ramesses II, Merneptah, erected an important palace complex near the temple of Ptah and the old capital city of Memphis rose to renewed splendor with his aid. Was the original text of the inscription on the Shabaka Stone written under his reign (ca. 1210 BCE) ? It is likely the alleged New Kingdom authors who wrote the original text (the text found by Pharaoh Shabaka) used lost originals, i.e. older sources. We know both major themes of the inscription (the unity of the Two Lands and the creation of the Ennead and the world through "divine words") are present in the literature of the Old and Middle Kingdoms (cf. The Creative Verb in Kemet). Perhaps our New Kingdom scribes found or were given access to libraries, worm-eaten documents or bits and pieces of the former cults of Ptah at Memphis. With this in hand, they wrote their XIXth Dynasty original, worm-eaten by the time of Pharaoh Shabaka (ca. 6 centuries later). They too were confronted with an older language and had to rework the material to honor the cult of Ptah (as did Shabaka's scribe after them). The egyptologists of the British Museum rightly assume the Shabaka inscription itself is a compilation, reproducing the layout of earlier documents and introducing a number of archaisms (older spellings & grammatical usages) to lend the piece an air of antiquity. That Shabaka's scribe succeeded, may explain why it took egyptologists so long to correctly date the original text mentioned in the colophon. Junge points out Shabaka's claim may well be true in a literal sense, i.e. Shabaka's rescue made the text indeed "better than it had been before", because he had arrived at a superior, more complex and advanced conceptual configuration than what had been available to him in the original, worm-eaten documents. The Kushite Pharaohs from Nubia constitute the "XXVth Dynasty", also called "Napatan", from the city of Napata near the 4th cataract of the Nile (one of the Kushite kingdom's principal cities). For the Israelite prophet Isaiah, it was "a land shadowing with wings beyond the rivers of Kush", for the Assyrians, Kush was a "far and inapproachable region". 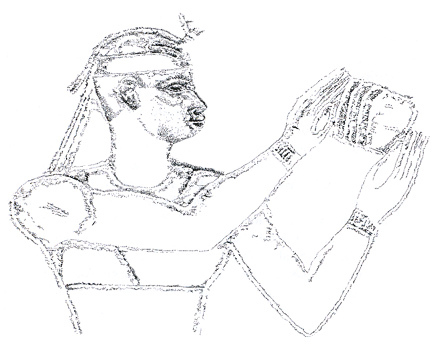 The southern limits of Kush were regarded by the Egyptians themselves as the "horn of the earth" (i.e. the outer limits). "This image of a remote and exotic land, the source of ivory, gold, incense and slaves, was perpetuated through Greek and Roman literature into the writing of modern Egyptology." - Morkot, 2000, p.1. The conquest of Egypt by the Kushite kings in the 8th century BCE was portrayed as an unexpected event (cf. 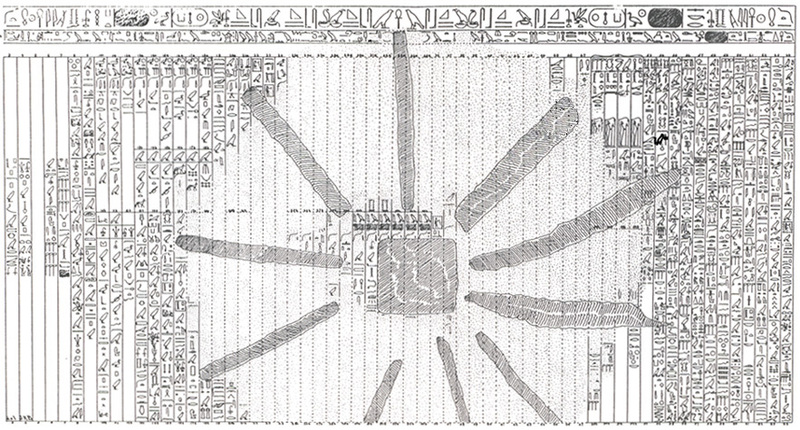 the Victory Stela of Piye), with no prologue. However, the tradition of rulership in Nubia extends back as far as two thousand years before the emergence of the Napatan state. This continued under Egyptian rule and was influenced by the Egyptian style of kingship. To understand the period the Kushites dominate Egypt, we must look back at the development of states and rulerships within Nubia, from Predynastic Egypt up to the 8th century. Let us trace these important steps. The southern boundary of the Predynastic kingdom of Nekhen (Hierakonpolis) was Gebel Silsila, the narrowest point on the Nile and the northern limit of Nubia. Its main trading centre was probably the island of Abu (Elephantine), at the foot of the 1th cataract, reflecting the importance of ivory as one of the more important southern commodities (along with ebony, incense, vegetable oils & animal skins). Wine, beer, oil and perhaps wheat and barley were also exchanged for the valuable raw materials. Rock-drawings of boats of Predynastic type have been found as far South as Sabu at the 2th cataract. The rapid development of strong states around 3100 BCE was not confined to (Upper) Egypt. Rather, there existed a mutual influence. Climatic changes and variations in the flood levels alone do not explain how the people of Nubia and its powerful kingdoms came to their end. The depopulation of Lower Nubia during the period of the Old Kingdom went hand in hand with the rise of the Pharaonic state. The Egyptian Pharoah was no longer content to exchange goods but desired to gain control of the Nile route to the South, exploiting Nubia's natural resources directly. Ruthless interventions through military actions crushed the local powers, realized by the reign of Djer (early Ith Dynasty). The surviving Nubians were driven into the regions flanking the Nubian Nile valley (possible the more fertile eastern hills & wadis). The Egyptians exploited Nubia's resources. The largest settlement in Nubia was at Buhen, at the foot of the 2th cataract (founded early IIth Dynasty). Djedkara-Isesi is the last Old Kingdom Pharaoh attested in Nubia. These kings relied on Egyptian rather than local labour. In the later Old Kingdom, the climate deteriorated throughout North-East Africa, resulting in the VIth Dynasty in conditions similar to those of the present-day. Rhinoceros, elephant and giraffe which had existed much earlier in Egypt and Lower Nubia had dissapeared and could only be found in Upper Nubia and further South. A new culture emerged in Nubia. This "C-group" is in many ways so similar to that of the Nubians of the A-group (of Egypt's Predynastic times) that scholars agree its people descended from it. By the VIth Dynasty, Pharaoh did no longer control Lower Nubia. To acquire goods from the South, he had to negotiate with Nubian rulers again. Hence, the Old Kingdom Pharaoh's had not been able to eradicate the Nubians. At the end of the reign of Pharaoh Pepi II, the local elites of Egypt (the "nomarchs" or local officials of the districts, the "nomes") gained more power. In the decades following his death, a breakdown of centralized government ensued. There had already been famines in the Vth Dynasty, and this problem recurred. At first, the local officials acknowledged the Memphite kings as the source of legitimate divine & political power. Then, they arrogated many of the royal epithets. Eventually, they forgot about their allegiance to Memphis and assumed royal titles. Two major nomes emerged : "Nen-nesut" (Herakleopolis), south of Memphis and "Waset" (Thebes), in Upper Egypt. Lower & Upper Nubia were affected by these changes. Trade was disrupted but did not cease. Local armies included contingents from Nubia. With the expansion of Theban power, interaction with Nubia became inevitable. Nubian mercenaries lived and worked in Upper Egypt, and these soldiers had Egyptian servants, suggestive of their high status. Texts record how the Theban rulers lead their armies into the northern part of Nubia. When Pharaoh Nebhepetre Menthuhotep II reunited Egypt (ca. 2040 BCE), a new period of stability was inaugurated. The prominence of Nubian militia in Upper Egypt during the ascendancy of the Theban princes may have lead to marriage alliances between, on the one hand, the ruling families of Nubia and the Eastern desert, and, on the other hand, Theban rulers. Some have speculated that the four consorts of Menthuhotep II were of Kushite origin, if not Pharaoh himself. In the Prophecies of Neferti, we read : "Ameny, the justified, by name, son of a woman of 'Ta-Seti', a child of Upper Egypt." "Ta-Seti" or "Bow-Land" was the name for the 1th nome of Upper Egypt (from Elephantine to Edfu) as well as for Nubia. Pharaoh Amenemhat I, who was assassinated, may have had some Kushite blood. By the time of the latter's coronation, Nubia had regained its independence and was ruled by local kings who adopted the style of Pharaohs ... However, by the time of the XIIth Dynasty expansion, the united kingdom of Lower Nubia was a formidable obstacle. Intense Egyptian military activity ensued. After a series of major campaigns (taking a full century), Nubia was subdued. But, once the trade routes had been secured, no attempt was made to integrate the Nubians of the "C-group". The Egyptians built a number of forts to protect access to gold-mining regions (cf. the Middle Kingdom fortress of Buhen, well under way by year 5 of Senwosret I - ca. 1923 BCE). The Lower Nubian kings posed no threat and payed their "inu"-tribute, evidence of an alliance with Pharaoh. In Upper Nubia, the kingdom of Kerma (on the East bank, South of the 3th cataract) flourished (Kush was based upon Kerma). The rulers of Kerma acted as the main intermediaries for the transmission of goods from the south to Egypt. Initially, Kerma-culture (which seem to develop about the time of the First Intermediate Period) was supported by the Egyptians of the Middle Kingdom. Its power climaxed in the late Second Intermediate Period. The kingdom was court-based and wealthy. At the beginning of the XIIIth Dynasty, Egypt withdrew from Nubia and entered a period of great confusion. Kush (founded on Kerma) becomes the most important state in Nubia. The Kushite expansion into Lower Nubia & beyond begins. They managed to penetrate the outer defences of Buhen and capture & burn the inner fort. Extensive destruction followed. In Lower Nubia, C-group culture continued to flourish. It reached its peak although under the political rule of the Kushite kings. Those in command gave the Kushite kings access to both the desert roads and the river route to Upper Egypt. They traded directly with the new rulers of the Delta, the Hyksos kings of Avaris (Lower Egypt). The presence of Egyptians at Buhen and other forts points to a considerable egyptianization of Kerma culture. The Theban princes, trapped between the Hyksos and the Kushite -who seek alliances against Thebes- move to reunite Egypt under their own rule. Kamose (Wadjkheperre), with whom the Second Intermediate Period ends (ca. 1539 BCE), regained control over the 2th cataract and reoccupied the fortress at Buhen. His brother Pharaoh Ahmose (Nebpehtire, ca.1539 - 1514 BCE) was victorious against both the Hyksos and the Kushites and initiates the XVIIIth Dynasty and with it the "imperial age" of Egypt. While engaged with the Hyksos, Buhen had been under attack by the Kushites. For the Egyptians, the Kushite kingdom thus remained a threat. In regnal year 2, Pharaoh Tuthmosis I (Akheperkare - ca.1493 - 1482 BCE) inflicted a major defeat on the Kushite state, with the attack of Kerma itself. The city recovered quickly. The Egyptians withdrew and established their southern border at the 2th cataract (Lower Nubia had been incorporated into Egypt). The resistance was however not broken and conflicts in Lower Nubia were more than likely. Pharaoh Tuthmosis III (Menkheperre - ca. 1479 - 1426 BCE) made the Kushites finally bow to the Egyptian rule. Pharaoh drew the official border at the 4th cataract, erected the fortress of Napata called "Semakhasetiu" or "Hacking up the Foreign Lands" and named the mountain Gebel Barkal : "Throne of the Two Lands". But Egypt's influence stretched much farther. Indeed, Pharoah had reached the land of Miu (central Sudan) where the rhinoceros was captured. Tax & tribute of Upper Nubia flowed into Pharaoh's treasury. In the reign of Pharaohs Amenhotep II or Tuthmosis IV, 150 years after Egyptian rule in Nubia, the administration of the whole region was reorganized along Egyptian lines : the Viceregal system. Two provinces were created : "Wawat" (Lower Nubia) and "Kush" (Upper Nubia). A Viceroy ruled Nubia as a whole (from Nekhen to the 4th cataract). Each province came under the control of an official directly responsible to the Viceroy (just as the Viziers were subordinate to Pharaoh). In return of the goods of the South, these officials would receive Egyptian foodstuffs, cloth, manifactured objects, military and political support. As there are no records of trading expeditions, we may assume that the provincial governors were Kushites. Once absorbed into the Egyptian system, the Kushites were depicted as Egyptians. The education of Kushite princes at the Egyptian courts assisted the assimilation of Kushite culture into the Egyptian imperial civilization of the New Kingdom. Ambassadors of Lybia (stretching along the Meditarranean littoral as far as Cyrenaica) visited the court of Akhenaten. But with the reign of Pharaoh Horemhab (ca.1319 - 1292 BCE), the Libyans are recorded as enemies of Egypt. They invaded the Delta on a massive scale. Libyans and Kushites are said to have planned an unsuccesful joint attack on Egypt. Ramesses III (ca. 1186 - 1155 BCE) was the last Pharaoh able to counter the Libyan invasions. At the end of the New Kingdom (ca. 1075 BCE), the power of Pharaoh had weakened. In the period which followed, the Third Intermediate Period, Nubia and the eastern desert were lost again (as well as the "Asiatic" regions). The title "Viceroy of Kush" becomes extinct. With Pharaoh Shoshenq I (945- 924 BCE) the Lybian tribal chieftains of the Delta rise to the throne of Egypt. By that time, they too had been assimilating Egyptian culture & customs for several generations, and seemed not essentially different, although Thebes hesitated. By the time of the Kushite invasions, there were four Pharaohs ruling in different parts of Egypt. In the middle of the 8th century BCE, a new political power appeared in the extreme South. It had for some generations been building up an important kingdom from their center at Napata at the 4th cataract. They felt to be Egyptians in culture and religion (Amun). The first king of this Kushite kingdom was Kashta. With Piye (740 - 713 BCE), probably his eldest son, we draw nearer to Pharaoh Shabaka. Piye himself was crowned in the temple of Amun at Gebel Barkal, as "Horus, Mighty Bull, arising in Napata". He went to Thebes to be acknowledged there. After having consolidated his position in Upper Egypt, Piye returned to Napata (cf. "Victory Stela" at Gebel Barkal). In Lower Egypt, a future opponent, Tefnakht ruled the western Delta, with as capital Sais (city of the goddess Neith, one of the patrons of kingship). Near Sais were also the cities of Pe and Dep (Buto), of importance in the earliest periods of Egyptian history, and cult centre of the serpent goddess Wadjet, the uræus protecting Pharaoh's forehead (the raging Eye transformed and symbol of Pharaoh's assimilation of the Great Goddess of the sacred of predynastic times - cf. To Become a Magician). When the rulers of Thebes asked for help, Piye's armies moved northwards. When he sent messengers ahead to Memphis with offers of peace, they closed the gates for him and sent out an army against him. But with no avail. Piye returned victoriously to Napata and never went to Egypt again. Pharaoh Shabaka, this black African "Ethiopian", was the first Kushite king to reunite Egypt by defeating the monarchy of Sais and establishing himself in Egypt. Piye before him had defeated the Egyptian dynasts, but had victoriously returned to Napata. Shabaka, who figures in Graeco-Roman sources as a semi-legendary figure, settled the renewed conflicts between Kush and Sais and was Pharaoh in Egypt, with his Residence and new seat of government in Memphis (cf. Frankfort on the importance of Memphis). Indeed, Pharaoh Shabaka modelled his reign upon the Old Kingdom Pharaohs. "Men-nefer" or "Memphis" was the capital of the first nome of Lower Egypt. It was called "horizon of the Two Lands", "city of walls", "the balance of the Two Lands". In the city or its neighbourhood were the temples of Ptah, Sekhet, Bast, Hathor, Osiris, Seker and of course Re. The temple of Ptah was on the eastern side. In the Old Kingdom, Memphis was the place were Pharaoh was coronated in the definitive ceremony of succession. Pharaoh Shabaka residing at Memphis was the political proof Egypt had been reunited. The Shabaka Stone, with its Pyramid Texts styled language & archaism, was originally set up in the temple of Ptah at Memphis, to which both Piye and Shabaka had added structures. It is clear this stone had to prove the legitimacy of the power of the Nubians and the Nubio-Sudanese Kushite Dynasty (Egypt and the whole of Nubia unified). The Shabaka Stone proved Pharaoh of Memphis was again the sole ruler uniting the "Two Lands" ... Shabaka consolidated Kushite supremacy and his reign saw the first major building works of the Kushites in Egypt. In the Theban region the temple of "Ptah-South-of-his-Wall" was enlarged. The shrine of Amun at Thebes and Hathor at Dendera proved his concern for the temples throughout Egypt. His constructions at Thebes are best preserved. However, the "Ethiopian" Dynasty did not stop the further decay of Egyptian autonomy and unity. Thebes was sacked under the Assyrian occupation (671 - 664 BCE) and although Psammetikus I (Wahibre) expelled the Assyrians, Psammetikus III (Ankhkaenre) was kept in power by the Persians but commited suicide (end of the XXVIth "Saite" Dynasty, marked by a resurgence of the arts, based on the classical forms of the Old and Middle Kingdom). On the large roll of papyrus, discussed in the second part of Sethe's Dramatische Texte, is found the accession script of the "mystery play of the succession" (Frankfort) of Pharaoh Senwosret I (Middle Kingdom), probably containing elements antedating the Middle Kingdom. It seems this play was performed during the transition after the death of Pharaoh's predecessor but before his coronation at Memphis and this seemingly in several cities throughout the land (the god receiving the offerings is indicated by a generic term only). It was necessary of Pharaoh to pass through these repeated ceremonies at the various cities to establish the necessary politico-religious ties to his "Great Throne" at Memphis (compare this with his circumambulations of the "Heb-Sed" court during the Sed-festival). During the mystery play, Pharaoh remained on board of the royal barge, serving as his quarters during travel. In the mystery-drama on the Shabaka Stone, the succession-drama is intra-divine, for Ptah as Horus is Pharaoh of the Two Lands. As had been the case in Old Kingdom ritualism, the deities only conversed with the other deities. There was no mediator between the sky and the Earth, except Pharaoh, who was the only son of the deities who's Akh or spirit really existed on Earth. He was the only god with a human form who actually lived on Earth (while the other deities could be invited to dwell here by offering to their doubles and souls but in essence or spirit lived as Akhs in the starry sky). In the theology of Memphis, Ptah is more than just another god or goddess. The deities and the whole of creation are all "in" Ptah and Ptah is the "very great" who encompasses all possible states of existence. A higher level of proto-rational theological discourse is reached, while the old pantheon is not relinquished. Did the Kushite Ptah of Pharaoh Shabaka not resemble the Ramesside Amun-Re ? Yes, for the latter was also essentially one, hidden ("Tenen" as "hidden one, whose eternal form is unknown") and pluri-form (millions). No, for Ptah created the All with what he thought and what he said (cf. The Created Verb in Kemet).